If you get this error message, "Sorry it looks like you're on a slow connection…," Office is taking a really long time to install, or it appears to hang during the install, you may want to cancel the installation and then try some of the following solutions. Are you trying to install Office on a Mac? If you're trying to install Office on a Mac, follow the steps in Uninstall Office for Mac, and then restart the Office installation. If you're installing Office on a PC (desktop, laptop, or 2-in-1), try these solutions in the order listed. 1. Does Office hang or freeze at 90%? If your Office installation hangs or freezes at the 90% mark as shown in the screen capture below, this could be because the Windows Installer is busy. For a possible solution, see Installation of Office hangs at 90%. The Office installation may have completed. So, after you've restarted your computer, go to Can't find Office applications in Windows 10, Windows 8, or Windows 7? to see if Office actually did install. If Office did not install, try to reinstall after switching to a wired connection. This can help speed up the installation because a wired connection is usually faster than a wireless one. After that, restart the Office installation. The Office offline installer may help bypass potential proxy, firewall, antivirus, or Internet connection issues that might occur during an Office installation. For steps to install an offline version of Office, see Use the Office offline installer and select the correct tab for your version of Office. If Office still isn't installing, try some of the options below. Open Control Panel, and select Programs and Features. 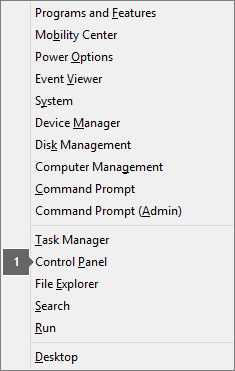 In the Uninstall or change a program window, from the list find and select the Office product you're trying to install. Tap or click Change, select Online Repair. Completely remove Office using the easy fix tool and then reinstall it. Tip: Do you have an HP 4500 or HP 8500 OfficeJet printer and trying to install Office? If so, stop the spooler service before you start installing Office again. Click this easy fix button to uninstall Office. At the bottom of the browser window, select Open to open the O15CTRRemove.diagcab file. If the file doesn’t open automatically, choose Save > Open Folder, and then double-click the file (it should start with "O15CTRRemove") to run the easy fix tool. The Uninstall Microsoft Office wizard launches. Select Next and follow the prompts. When you see the Uninstallation successful screen, follow the prompt to restart your computer for the changes to take effect. Select Next. Restart your computer and then try installing Office again. To reinstall Office select the version you want to install and follow those steps. In the lower-lower left corner select the o15CTRRemove file and from the drop down, select Show in folder. Double-click the download, o15CTRRemove to run the easy fix tool. In the upper-right browser window, select Show all downloads. 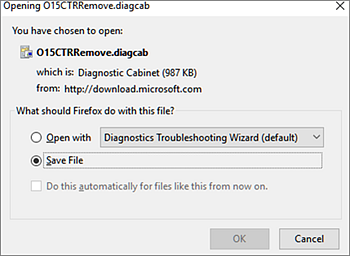 In the Library, select Downloads > O15CTRRemove.diagcab, and then select the folder icon. Double-click the O15CTRRemove.diagcab.